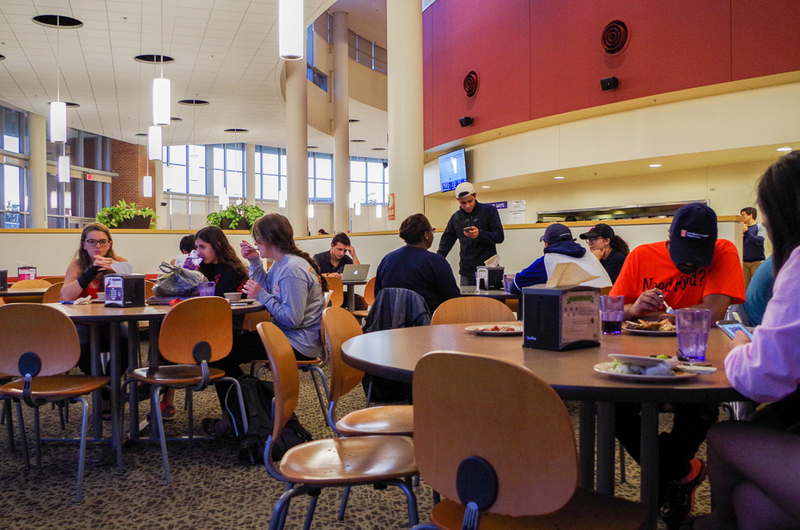 Students eat at the Ikenberry Dinning Hall and enjoy the multiple cuisines it has to offer. For students like Ally Farrow, sophomore in Community Health, mealtimes in the University dining halls can be a source of stress. Farrow, who has had several tests done to identify allergens, could not get a medical note to receive Inclusive Solutions, an allergy-friendly meal preparation program, which is offered by the dining staff. Farrow claims she has been light-headed and nauseous to the point where she must leave the dining hall with her plate of food still on the table. She found it especially hard to find fresh, healthy foods that were both good for her body and her allergies. But the University does have employees in place to combat these issues, even if people do still fall through the cracks. Erica Nehrling, assistant director and dietitian of dietary services in the dining halls, works with Disability Resources and Educational Services, McKinley Health Center and various event planners to ensure the safety of the students. She also works to ensure that the student and managing staff meet safety standards. “If I identify a staff member that doesn’t seem to have the compassion and empathy or knowledge to be on the dining allergy team, I will pull them from the team if I have any suspicions,” Nehrling said. Inclusive Solutions is a dietary regulation system at the University where students with specific allergies can get meals made separately from the rest of the dining hall food. Because the meals are made in an allergy-free area, it can be difficult to be gain access to this system. Dr. Rachel Graddy, access specialist at DRES, works with Nehrling to set the rules regarding which students are able to participate in Inclusive Solutions. “The documentation guidelines for students with an allergy are the same as one with a disability,” Graddy said. Graddy explained that only a doctor with the ability to prescribe medication or treatment can be an acceptable source for verification of students’ allergies or intolerance. “We’re not really flexible on those credentials, but if a student doesn’t have a diagnosed allergy, a lot can self-regulate his or her allergies,” Graddy said. Because Farrow was unable to gain a doctor’s note, she has to self-regulate. When a student self-regulates allergies, they either use the University dining app or the EatSmart website. Using these two systems, one can identify the ingredients used in the foods and if any of that student’s allergies are present. Both Nehrling and Graddy agree that having a medical doctor’s note versus a chiropractic/naturopathic doctor’s note is the only thing that can be accepted in the dining halls. “I have seen people get a diagnosis from a naturopathic doctor that is way more strict than it needs to be or it is incorrect because it is not based on sound research,” Nehrling said. Nehrling said if they were to honor these methods of diagnosis, then she is promoting falsehood for the students. “Now, I’ll never tell a student it’s in their head or that I don’t believe them. I know how hard it is, and I went through five years of elimination diets,” Nehrling said. She acknowledged that she is aware it costs money and time to go through a doctor, but for her, Nehrling came out with a diagnosis she can carry for life. She is very willing to help students find a solution, Nehrling said, and if anyone who is unsure of where to go, then she can refer them to medical doctors in the area or dietitians at McKinley. Despite their efforts, some students who self-regulate their allergies have been unsuccessful in the University dining halls. Jacob Light, sophomore in the College of Applied Health and Sciences, has a peanut allergy that has been difficult to handle in the dining halls. He said, though, that he has never had a reaction severe enough to where he had to use his Epipen. Lauren Engelhard, sophomore in DGS, has an intolerance to gluten, which causes difficulty to find food in the dining halls. “There were things that were gluten free but not much variation. By the end of the year I felt like I was eating out all the time,” Engelhard said. Engelhard said that in regards to how well the food was prepared, she had few issues with allergic reactions. “There was one meat item that ended up having an obscure ingredient that was in the marinade, which made me sick,” Engelhard said. Farrow, Light and Engelhard all agree that the labeling in the dining halls is probably the biggest thing that could use improvement. “The reason we don’t label allergies at the point of service is because we used to have larger signs where we could have fit everything on but they were so close together on the sneeze guard that they would get mixed up,” Nehrling said. Both Graddy and Nehrling made the point that this is the same rule across most Big Ten schools and major universities across the U.S. 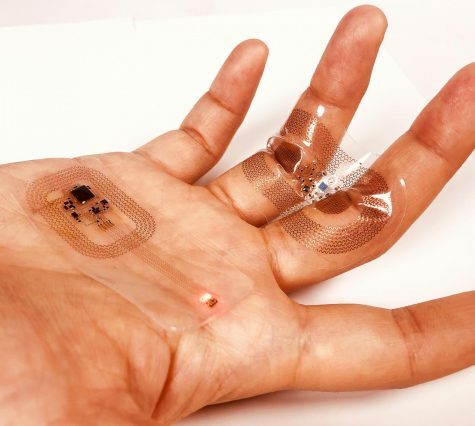 However, many students who navigate by simply using the phone application or website still experience allergic reactions. Most students who qualify for Inclusive Solutions don’t seem to be aware of the program to avoid this. Nehrling knows the program’s marketing is an issue, so if more students were aware of the options they have, it is possible there would be less reactions in dining halls. “Each year I email the students who check off that part of the housing contract that identifies they have food allergies,” Nehrling said. Nehrling has already started improving this year by providing purple tents at any outdoor event, since purple signifies food allergies. “These students can come to the outdoor events and navigate and have fun like everyone else, not having to eat separately,” Nehrling said. 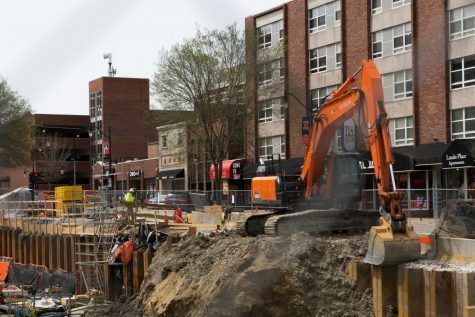 Yet, Nehrling knows there is always room for improvement — display a full list of ingredients on the mobile app, continue training staff, increase marketing and develop a new allergy-aware dining area in ISR, which is set to open in the fall of 2020. “I’d be more than happy to help any students struggling with dietary restrictions. My goal is not to turn away students, but rather to assist them navigating based on science,” Nehrling said.